The Anesthesia Patient Safety Foundation seeks to recognize organizations that have made significant advances in safe medication administration during anesthesia care. Best practices in any of the areas of safe medication administration covered by the STPC paradigm* – Standardization, Technology, Pharmacy, Culture – will be considered for the award. Special consideration will be given to practices with well described processes that complement patient care workflow and integrate documentation with the EHR. Evidence indicating improved medication safety is most desirable but it is recognized that qualitative evidence of process improvement (eg. surveys of user acceptance) may be the best available evidence. Actual implementation experience in patient care is also required rather than projects or ideas that have yet to be implemented. Submitters are encouraged to describe lessons learned including unintended consequences and revisions in technology and/or workflow that have resulted from the implementation process. Awardees will be invited to the upcoming Stoelting Conference on Medication Safety in Anesthesia to be held September 5, 2018 in Phoenix, AZ to receive the award and present their work. They will also be recognized with a certificate from the APSF and publication of their work in the APSF Newsletter, website and social media feeds. 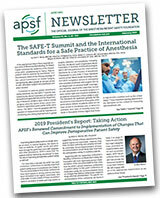 The APSF newsletter is currently sent to more than 120,000 anesthesia professionals. Honorable mentions will also be awarded to other noteworthy submissions and that work will be publicized as well. Submissions will be reviewed by members of the APSF Committee on Technology. The award will be approved by the APSF Board of Directors and announced by August 1, 2018. Award Applications should be submitted to: Yulonda Motley, Assistant to Jeffrey M. Feldman, MD. Chair, APSF Committee on Technology at motleyy@email.chop.edu.